Give your students simultaneous access to every volume in the Defining Moments series while they are in the library, the classroom, at home, and on the move with Defining Moments Online. 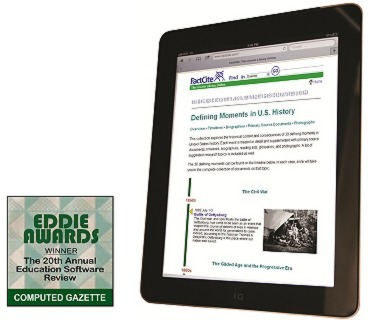 Defining Moments Online adds the ease of searching across every volume in the series and the opportunity to browse topics with an interactive timeline to all of the features that make each Defining Moments print volume so valuable for assignments. Students will appreciate the extensive linking, expanded resources for further research, and other online-only features that will aid in their comprehension and the identification of main points. Purchase 5 or more Defining Moments volumes and receive a free 1-year subscription to Defining Moments Online (a $249 value). No promo code required. Discount will appear in your cart at checkout. Click here to request a free 30 day trial.